Is your little guy or girl into marine biology? Do they spend their days talking and thinking about fish, seashells, mermaids and other crazy creatures of the sea? Well then we've got the perfect costume ,he or she can finally go beyond just studying sea creatures and instead be the real thing with this child Seahorse Costume. Because everyone knows if you really want to understand something you've got to get in its mind, you know really go full on seahorse. We are always telling our kids they can be whatever they want to be, anyfin is possible...ok technically seahorses don't have fins but whatever! This seahorse costume lets all of your child's marine life dreams come true, no longer be just a fanta sea! 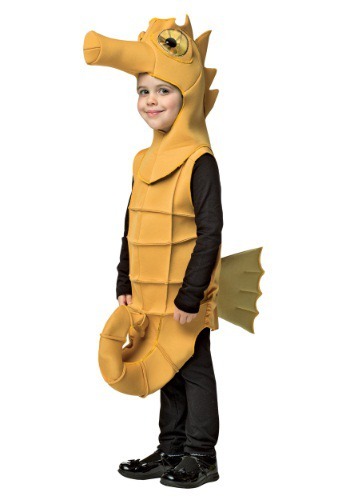 We do have to warn you though parents, this costume may cause your little seahorse to be a bit shellfish with their loot of candy this year. So now with our child seahorse costume they can see what it's really like to be a creature that's sort of horse-like but also lives under the water. Spoiler alert... it's riveting! And hey parents, we know you've already got enough on your plate so we tried to make it a little easier on you this year, we made this costume perfect choice for any little marine life lovin' kid, boy or girl!